I’m a firm believer in using the media (TV, Radio, Newspapers) to promote my clients’ offline businesses. It’s the ultimate in social proof for your clients, and probably one of the easiest ways for you to keep a lifelong marketing customer (you can show that you are VERY different from the other so-called offline marketing experts). 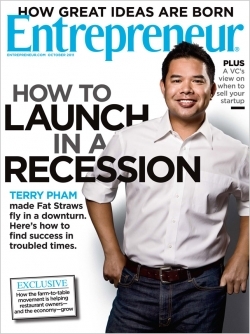 This month I was able to get a spot for myself and a Veterinarian in Entrepreneur Magazine. In all honesty, it’s extremely easy to get featured in a major magazine if you have a good story to tell. Remember that writers need to fill their articles with quality content, just as much as you need your product or service to be publicized. All that it really takes is a well written Press Release, submitted through the proper channels. Start with a few small local papers, and work your way up as your confidence level builds. There’s nothing stopping YOU from doing the same for your marketing business or your clients! 1. What Kind Of PR Have You Received For Your Business / Clients? 2. How Did You Go About Obtaining The Media Attention? This entry was posted in PR, Uncategorized. Bookmark the permalink.